The advent of the multimedia industry and its potency has taken everyone by surprise. We use TMD online to help us navigate through the thousands of marketing options so that we can achieve the best outcomes for our clients. TMD Online’s expertise in this area is second to none. You need flash installed to view this content. Headline Advertising is a full service Ad Agency based on the Gold Coast with a knack for retailing and strengthening brands. Their clients are large, small, locals, nationals, start-ups, retail driven, service driven and brand driven. Headline wanted a web development partner that understood the importance of service, reliability and the ability to deliver campaigns and solutions that were flexible and intuitive. Headline identified that they could not afford to be working with templates or inflexible solutions - their clients and their requirements are to complex to fit into “one mould”. We deliver highly customised online solutions for Headline on a daily basis (if their designers can think it up, we can put it together). “Accurate production from our briefs is really important to us, but also we need to know how the internet is evolving – we need to know if there is new technology or methodologies to deliver better campaigns. TMD really delivers with both advice and face-to-face service”. We also offer advice on how to promote their clients online through Social Media, Email Marketing and Search Engine Optimisation and Advertising. Tight timeframes come hand in and hand with advertising – we know this, and work together with Headline to meet deadlines. We pride ourselves on service and our customer guarantee is central to our commitment to each and every one of our clients. 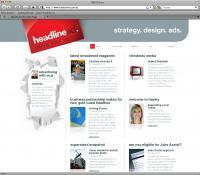 Dave Lister – Partner Headline Advertising.